. 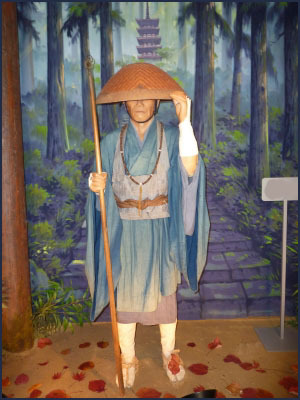 Enku Memorial Museum in Seki .
. 円空上人と小さな仏さまたち Saint Enku and the small Buddha Statues . 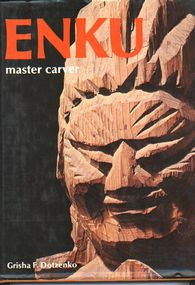 Once Enku performed exorcist rituals and prayers (加持祈祷) to heal the son of the carpenter Unokichi 大工卯之吉. The disease was caused by a curse of the robes which his mother had received while she was still in service at a Samurai home. When Enku washed the robes away in two rivers, the boy was healed. Once Enku performed exorcist rituals and prayers (加持祈祷) to heal a craftsman who had a severe swelling above his eyes and could hardly see any more. This disease was caused by the dishes used by the family. When they took out all the dishes and placed them into a nearby pond, the eyes were healed. 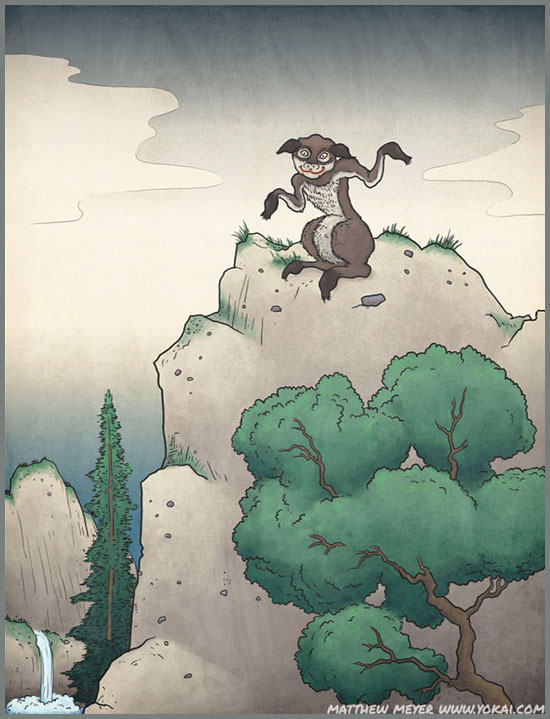 Yamabiko is a kind of mountain Yokai monster 山の妖怪. They are now made by 代情山彦. Around 1700 Enku climbed Mount Norikura-Dake 乗鞍岳 (3026 m). Near the top at the pond Oonyuu ike 大丹生池 (大丹生ヶ池) Onyu-Ike he appeased a Yokai monster and banned it to the peak of 魔王岳 Mao-Dake (Mount Demon).
. Hida no takumi 飛騨の匠 expert carpenter or craftsman from Hida . See the details about the Yamabiko Yokai below. Enku stayed here for a long time. Once there was an enormous rainstorm. 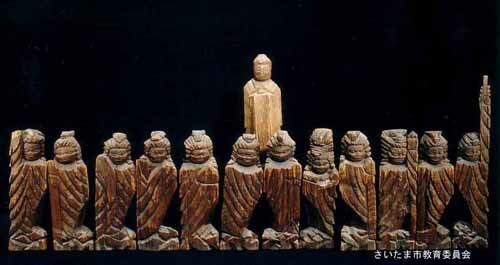 So Enku carved 十一面観音 a Kannon with 11 faces to appease the weather deities. And indeed, the rain stopped and the flooding of the river receded. The master of the pond Oonyuu ike 大丹生池 Onyu-Ike was in fact a huge serpent 大蛇 and some people had indeed seen it. When some of its family members moved out, there was always flooding of the river 高原川 Takaharagawa and people were quite afraid to talk about it.
. Enku at Norikuradake 乗鞍岳 - Introduction . The wilds of Japan are full of strange phenomena, like echoes that bounce back with more delay than they should, or that come back slightly different from the original sound. 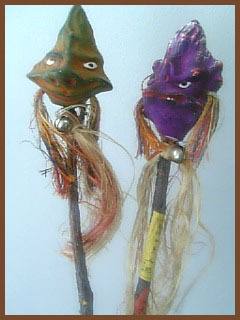 When the false echo comes from the forest, it is usually attributed to a ko-dama. 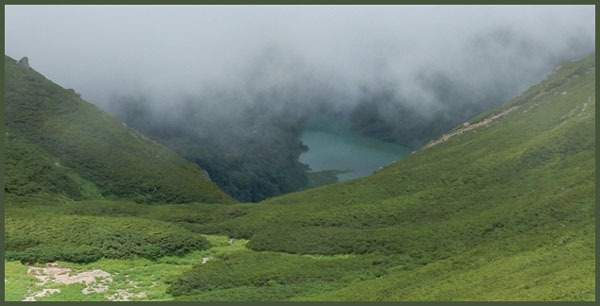 When it comes from the mountains, it is due to something called a yamabiko. They are very small, appearing like a cross between a dog and a wild monkey. Yamabiko are known almost exclusively by their voices alone, which are skilled at mimicking any sound, including natural sounds, human language, and more recently, trains and cars. They also occasionally unleash terrible and mysterious screams deep in the forests that can carry for very long distances. Little is known about these yokai due to their rarity and elusiveness. They live deep in the mountains and make their homes in camphor trees, living in close proximity to (and sharing a common ancestry with) the other tree and mountain spirits. For many centuries their calls were speculated to be a kind of rare bird, other kinds of yokai, or even natural phenomena. It wasn’t until the Edo period when determined yokai researchers like Sawaki Sūshi and Toriyama Sekien were able to confirm the creature’s existence and record its true shape. In Tottori, Tottori Prefecture, a yobuko (呼子) or a yobukodori (呼子鳥) that lives in the mountain is thought to give out the yamabiko's voice. In Kusuyama of Hashikami village, Hata District, Kōchi Prefecture (now Sukumo), regardless of whether it was day or night, when a sudden dreadful voice is heard deep in the mountains, this strange phenomenon is called "yamahiko." They are sometimes seen to be the same as the yamawaro, spoken of in Western Japan, as well as the yamako in the Wakan Sansai Zue, and as it is thought that tree spirits would cause yamabiko to occur, they are also seen to be the same as the yōkai penghou that lives in trees. In collections of yōkai depictions like the Hyakkai Zukan and the Gazu Hyakki Yagyō, the yamabiko that looks like a dog is thought to be based on the yamako or the penghou. The aforementioned yobukodori of Tottori is said to take on the appearance of a bird, and other than that, there is also a small rock mountain in Kitaazumi District, Nagano Prefecture called the "yamabiko rock" (山彦岩) that return people's words, among other appearances of the word "yamabiko," and thus it can be seen that the yamabiko as yōkai are not uniform in either origin or what kind of yōkai they are. "Child of the Mountain" - . 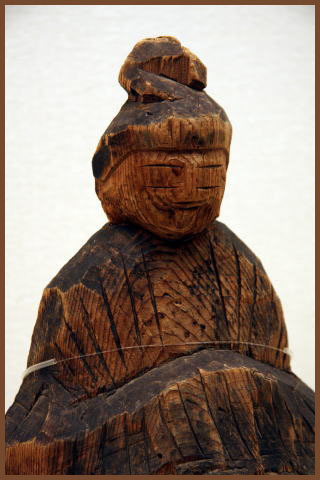 Kappa　河童 "Child of the River"
. Yamabiko Echo legend from Shimane .